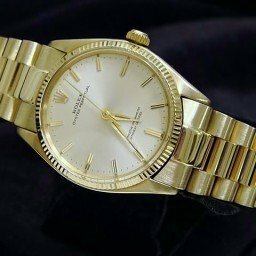 BeckerTime offers a selection of Rolex Oyster Perpetual mens yellow gold pre-loved watches sized 34mm with variety of dials, bezels, and bands.  We also offer a 30-day money-back guarantee with each purchase and a one year warranty on most watches. In addition, we offer personalized customer service. So, don’t hesitate to contact us for assistance. Also, we offer after-sales support and a Lifetime TradeUp Guarantee on qualified items. This means you can come back to us when you want to upgrade to another model. Rolex watches are the perfect example of a technology that has been steadily improved and delivered in the most exquisite manner possible. The company has taken traditional watch technology and have given it a quality makeover. One such innovation that Rolex uses is called automatic movement. This is a self-winding watch that uses kinetic energy to provide power. That power is provided by the movement of the wearer, which moves a weight in the watch, which in turn winds the main spring. Even the slightest movement can provide enough energy to wind the spring. Rolex didn’t invent automatic movement. That honor goes to Swiss watchmaker, Abraham-Louis Perrelet. His 18th century pocket watches used an oscillator, similar to a pedometer, to self-wind the mechanism as wearers walked around with it in their pocket. That mechanism has been steadily improved, by Rolex and other watchmakers into the finely-tuned works of art we wear today. The company introduced their improved version of automatic movement in 1930 with the release of the Oyster Perpetual. It used a counterweight that could rotate 360 degrees and introduced a spring that could store enough energy to power the watch for up to 35 hours. The automatic movement, as perfected by Rolex, has a mainspring that is wound by the movement of the arm of the wearer. The stored energy in the spring is enough to wind the watch, hence the term “self-winding” automatic movement. All of the watches in the Professional and the Oyster lines make use of the automatic movement of Rolex. Rolex continues to be the finest examples of automatic movement watches in the world. Do you like self-winding watches? Prefer Quartz? Let us know by leaving a comment. With a history that spans over a century, the Rolex catalog is brimming with choices. And that includes affordable gold Rolex models too. In fact, you can pick up a mens gold Rolex watch for less than $5,000—you’ll just have to go the vintage route. 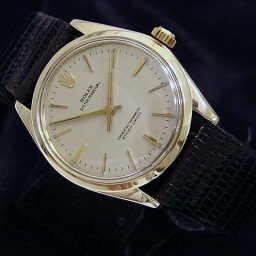 Let’s take a look at some affordable vintage Oyster Perpetual mens gold watches from Rolex. Today, we’re examining the vintage Oyster Perpetual gold mens watch with the four-digit reference numbers. There’s the Oyster Perpetual ref. 1002 with the smooth bezel, the ref. 1003 with the engine turned bezel and the ref. 1005 with the fluted bezel. The gold versions of these mens Oyster Perpetual watches are fashioned in either 14k or 18k yellow gold. As a dress watch, the vintage Oyster Perpetual ref. 1005 (and its siblings ref. 1002 and ref. 1003) sports a 34mm Oyster case—a very common size for men’s watches during the era. The four-digit Oyster Perpetual No-Date watches were manufactured from the 1960s up until the 1980s. Today, the 34mm men’s gold Oyster Perpetual watch is an ideal choice for someone who prefers smaller and classic Rolex watches. As is common with vintage models, these mens gold vintage Oyster Perpetual models are available with several bracelet options such as leather, Oyster Rivet, and Jubilee. Due to their age, the watches sometimes come with aftermarket bracelets. There are even some mens gold Oyster Perpetual models outfitted with solid gold President-style bracelets for a more luxurious way to way the vintage Rolex. The Oyster Perpetual is a time-only Rolex model without a date function. Subsequently, the dials of the mens gold Oyster Perpetual models are sumptuously symmetrical. For the most part, the OP ref. 1005 comes equipped with dials in neutral shades such as such as champagne, silver, white, or black, along with simple stick hour markers and center hands in matching yellow gold. Although they are vintage models, the Oyster Perpetual ref. 1005, 1003, and 1002 are indeed automatic chronometers, certified by COSC. Running on either Cal. 1560 (early models) or Cal. 1570 (later models), the mens gold Oyster Perpetual all include the “Superlative Chronometer Officially Certified” text on the dial. One of the major differences between the Caliber 1560 and the Caliber 1570 are the frequency rates—18,000 vs. 19,800 beats per hour respectively. Furthermore, Cal. 1570 includes the hacking feature where the seconds hand comes to a complete stop when the winding crown get pulled out. Aside from their classic Rolex looks and precise and reliable automatic mechanical movements, another great benefit of vintage mens gold Oyster Perpetual watches are, as we mentioned, their prices. 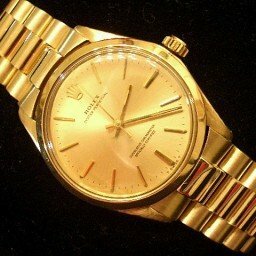 So if you’re in the market for a solid gold Rolex watch but don’t want to break the bank, then check out the mens gold Oyster Perpetual No-Date models.